Catherine Wheel , Harlequin, and Starburst Stitch. 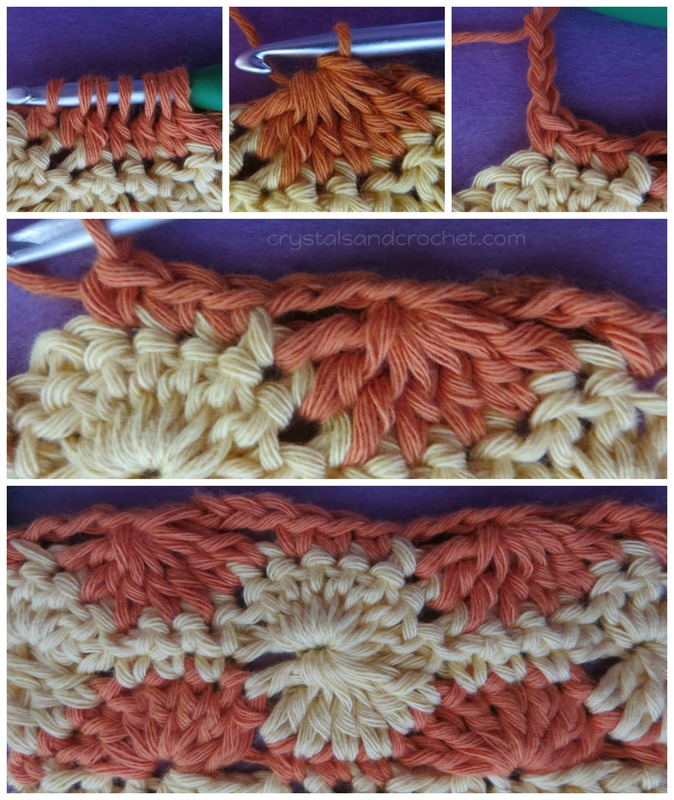 There are so many different types of crochet stitches. It can get really confusing for beginners or even more experienced hookologists, when stitches are given different names. 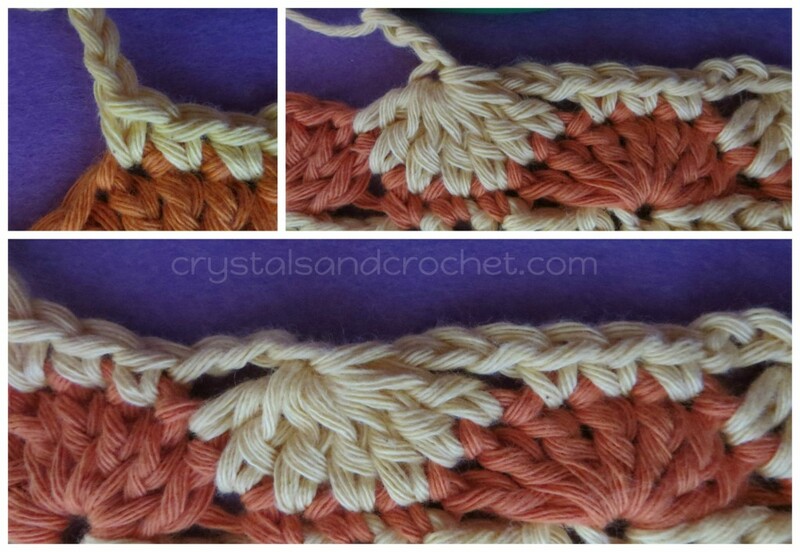 Today I wanted to share a tutorial on three such stitches. Catherine Wheel , Harlequin, and Starburst. Though they do look very similar they are in fact three quite different stitches. They are all stitches that involve fans and clusters. Normally they are all done using double crochet and single crochet with chains to carry you from one fan or cluster to the next. 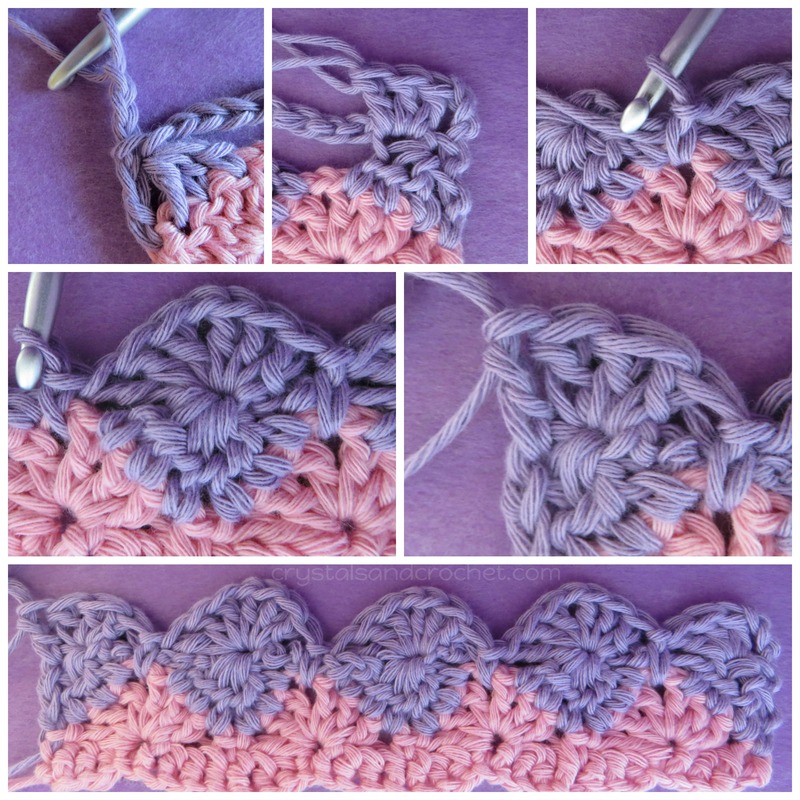 However Starburst stitch is also often done with treble crochet, which gives a larger circular stitch pattern. All three of these stitches are worked in rows of a repeat of four, normally starting with the first row as a “wrong side” row. However they can be worked “in the round”, which means you always have the right side of your work facing you. The ends of the rows, with the addition of a ch-2 space, form corners as you can see in this photo. The first row gives the foundation which the circular shape is then worked upon. Rows two and three form the circles and row four again defines the shape of the circle, or becomes the bottom half of the next circle. Though all of these stitches can be worked in just one colour, using two or more colours will give much more impact. As you can see in the photo Catherine Wheel has three single crochet between circles. Starburst has only one single crochet between circles. And Harlequin has a single crochet that drops down one row and also a chain one between groups of double crochet, giving the “circle” a diamond shape. So they are very different and here is how each of them are done……. Worked in multiples of 10 sts, plus 1 for first chain. Row 1. Sc in 2nd ch from hook or sc in 1st st, *skip 3 ch/sts, 7 dc in next st, skip 3 ch/st, sc in next 3 ch/st. * Repeat to end, ending with a sc, join new colour, turn. Row 2. Dc3tog [with starting ch 3, over sc and 1st 2 dc], *ch 3, sc in next 3 dc, ch 3, dc7tog [over last 2 dc, 3 sc, 1st 2 dc]. * Repeat to end, ending with dc3tog [over last 2 dc and sc]. Turn. Row 3. Ch 3 and 2 dc in top of dc3tog, *skip ch-3, sc in next 3 sc, 7 dc in top of dc7tog. * Repeat to end, ending with 3 dc in top of dc3tog. Join new colour, turn. Row 4. Sc in 1st dc, *ch 3, dc7tog [over last 2 dc, 3 sc, 1st 2 dc], ch 3, sc in next 3 dc. * Repeat to end, ending with a sc in top of ch-3. Subsequent rows are worked as a repeat of rows 1 to 4. If you are using more than two colours, and you may use as many as you like, just remember to change colour at the end of the row, once you have completed both “halves” of the wheels. Worked in multiples of 8 sts plus 1.
skip next 3 ch/sts, sc in next ch/st, skip next 3 ch/sts. * Repeat to end. Join colour 2 and turn. Row 2. Ch 3, skip 1st sc, dc3tog over next 3 dc, *ch 7, skip ch-1 space, dc6tog over next 6 dc [leaving the sc between groups unworked]. * repeat to last 3 dc and work 3dctog, dc in ch-1 and turn. Row 3. Ch 3, skip 1st dc, 3 dc in top of 3dctog, *sc in ch-1 space between dc’s 1 row below [enclosing centre of ch-7],(3dc, ch 1, 3dc) in top of dc6tog. * Repeat to last dc3tog and make 3 dc in top of dc3tog, dc in top of ch-3, join colour 1, and turn. Row 4. Ch 4, skip 1st dc, *dc6tog over next 6 dc [leaving the sc between groups unworked], ch 7, skip ch-1 space. * Repeat to end, ch 3, dc in top of ch-3, turn. If you are using more than two colours, and you may use as many as you like, just remember to change colour at the end of the row, once you have completed both “halves” of the diamonds. This can be done with groups of either 7 or 9 dc or tr. My example uses groups of 7 tr and ch-3 between. For 9 tr use ch-4 between groups. Row 1. Using colour 1, 7 tr into 5th ch from hook, or ch 4 and 3tr in 1st st, skip next 3 ch/sts, sc in next ch/st, *skip 3 sts, 7 tr in next ch/st, skip next 3 ch/sts, sc in next ch/st. * Repeat to end, ending with 4 tr in last st. Join colour 2, turn. Row 2. Ch 1 and sc in 1st tr, ch 3, tr3tog over next 3 dc, *ch 3, sc in centre [4th] tr, ch 3, tr7tog over next 7 sts, [these 7 sts are 3 tr, sc, 3 tr]. * Repeat to end, ending with tr3tog over last 3 tr, sc in last tr. Ch-1, turn. Row 3. Ch 4, 3 tr in top of 4trtog, *sc in sc, 7 tr in top of tr7tog. * Repeat to end making 4 tr in top of tr4tog, turn. Row 4. Ch 3, skip 1st tr, * 7trtog over next 7 sts, [these 7 sts are 3 tr, sc, 3 tr], ch 3, sc in centre [4th] tr, ch 3. * Repeat to end, ending with 4trtog tr4tog over last 3 tr and ch-1. If you are using more than two colours, and you may use as many as you like, just remember to change colour at the end of the row, once you have completed both “halves” of the stars. I hope you find this tutorial helpful, remember I am always ready to help when ever and where ever I can. Hi, I like your site, and i really like the Harlequin Stitch. I have been crocheting for years, but I just cannot figure out how to continue this stitch after row 4. Row 1 just does not work for me. Maybe you can help. I need to know just how to crochet row 5 on this stitch. Thank you so much. And thank you for your site. Hi. I’m working the Harlequin patern in an afghan using different stitches per so many rows. How do I switch over to a different stitches after finishing the 4th row of the Harlequin? Hi, I am working on the harlequin pattern and I am having some trouble transitioning from row 4, back to 1. Another pattern I was trying had it written: “*skip 3 ch, [3 dc, ch 1, 3 dc] in next ch, skip 3 ch, sc in next ch; repeat from *” In your pattern you have it repeating in the 5th ch all the way across but this doesn’t look right to me. It feels very offset from the rest of the pattern. What am I missing here? From row 4 you will just need to keep repeating previous rows, but making sure you are working into the “eye” of the dc6tog and into the skipped sc. Thank you so much for the pix and the instructions. This is a lovely stitch and I wanted it for a baby blanket. Thanks again. What size hook did you use? I like the starburst the best. I’m thinking of making an afghan for my mother in law. Wonderful clear pictures showing all the details i needed. Fantastic written directions. I wish you could write all the patterns i want! I have been asked to make an Afghan for my daughter using the Harlequin stitch. I am a basic granny square person so this stitch looked very daunting. I looked u some tutorials on youtube and found one by an american lady who got to row 2 then changed her mind part way through the row to what I now know from the info above as the starburst stitch, very confusing. Now that I have had time to read and practice using your tutorial I am confident I can complete the blanket sucessfully. Thank you for the clear instructions. Hi! I hope I’m not just being dense but what multiple should I use when chaining the foundation row for the starburst stitch if I want to work with groups of 7 dc?